Wow! Watch this super cool video of our mystery eggs hatching! Our mystery eggs are…… Quail eggs and currently we have two quails in 3s. I still can’t believe the excitement, awe and amazement you displayed on your faces as Mrs Daniels carefully freed the quail from the shell. I wonder when are next guest will be joining us? 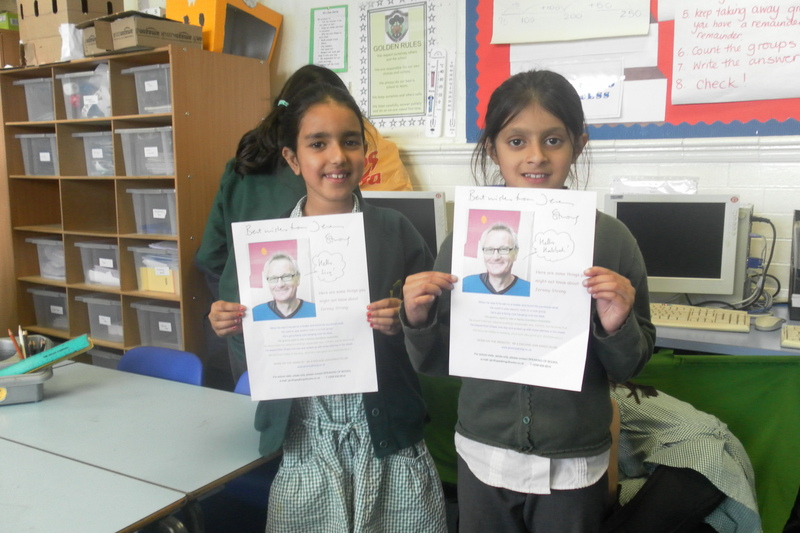 This week we have received a response from Jeremy Strong after we had sent him a letter as part of our work on authors and letters. 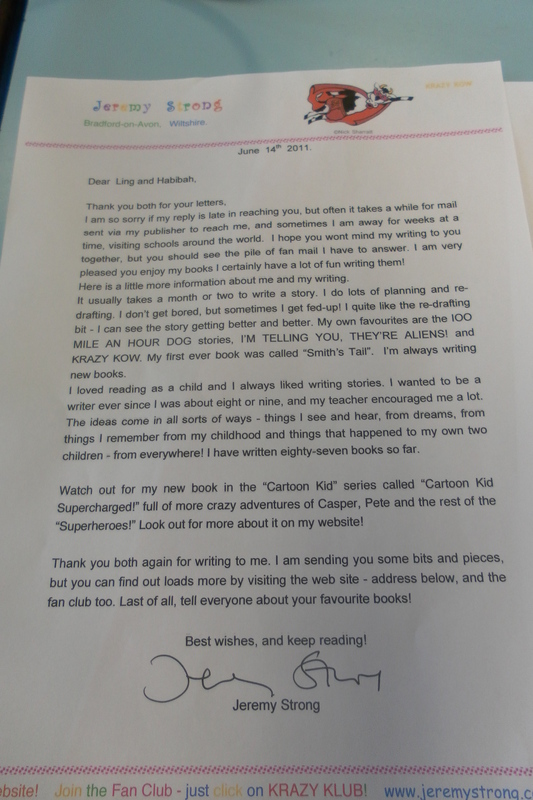 This letter states that he has always wanted to be an author/writer since the age of nine and that his teacher was a great influence in encouraging him to be a writer. 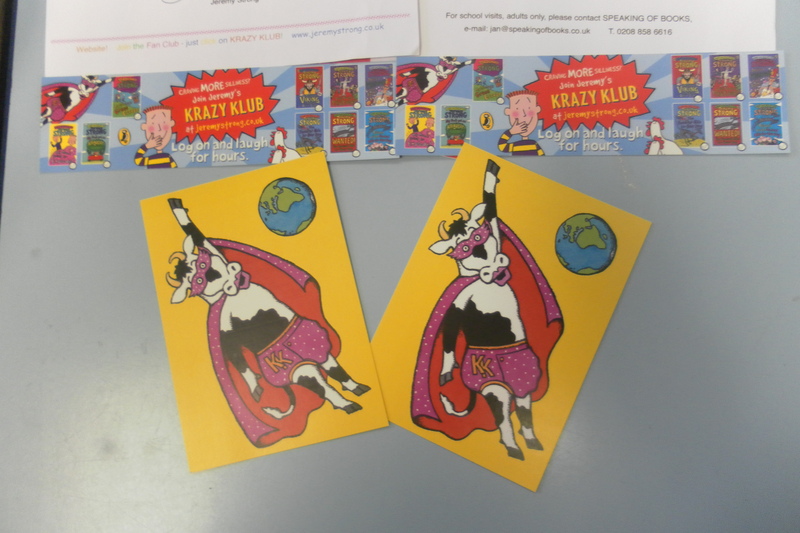 We received some super cool postcards and bookmarks from Jeremy Strong. In addition, we also got a signed pictures of him with some extra information about himself. 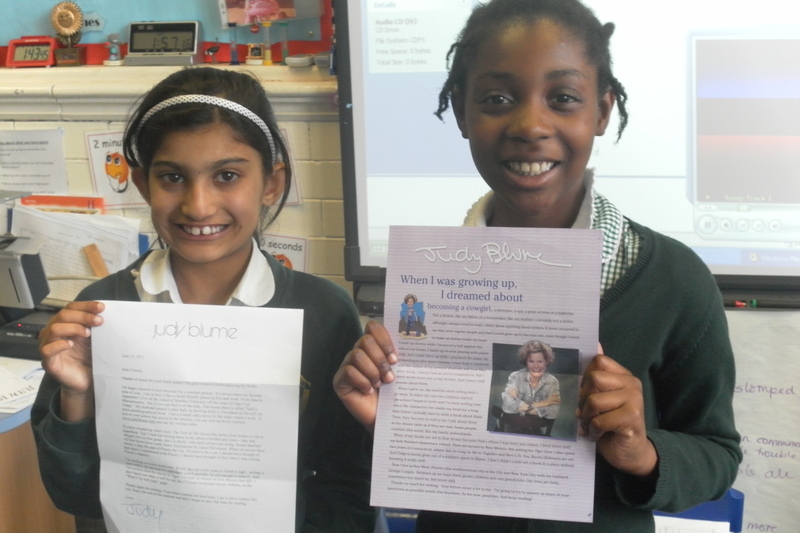 On Monday Miss Thomas spotted an envelope in the school office marked Judy Blume with an postage stamp. It was only a letter from …. Judy Blume! She had sent us a reply to our letters we had written in Literacy. It had taken a staggering 12 days to reach the Uk from New York. Miss Thomas read the letter to our class after lunch today. She informed us that she has a special writing cabin and that she has a new series of books coming out. I wonder who will write back next? In Guided Reading today some of Morpurgo chose to write a poem independently about our new arrivals! Their poem is so fantastic we wanted to share it with everyone. Please let us know what you think. And never be scared or have any fears. But instead it is grey and minute. And still it sits there cheeping loud. And one has stuck his head out and is breathing. We hope they hatch before Friday dawn. [slideshow]This morning there was exciting news because one of the eggs had hatched. When Miss came to get us she said that she had got some fantastic news but she would tell us until we came up stairs. I couldn’t guess what the news was! I felt excited to find out. When we got to the class we all lined up, then Miss told us that we had a new arrival and the baby chick had hatched but it wasn’t a chick it was a bit smaller! Then we had to be really silent so that it didn’t get scared and terrified. We went by the eggs and one of the eggs was wriggling and I looked over and saw one of the other eggs had…hatched! Everyone was so excited to see it, we found out that it was a quail not a chick because it had hatched out of the little egg. The quail was trying to make the others hatch. It is so cute and it looks grey to me. I think it’s a boy because it just looks like a boy to me! It’s got little feet and he walks with small footsteps. When it walks it always squeaks and we have been hearing it squeak a lot. His moms are Miss Smith and Miss Mortimer because he hasn’t got a real mum. One of the other eggs was trying to hatch but it was stuck, this was the wriggling egg I just told you about. If we make any noise we might frighten it and it is only little. We are going to look after all the eggs and hopefully help them to ‘Come Alive’. We need to feed them and care for them. The other quail is trying to get out of it’s egg still and we will write to you again when it hatches. ..
ANOTHER NEW QUAIL HAS ARRIVED! After lunch when I came back to class I couldn’t believe it another Quail has cracked his shell and has hatched. I’m still not sure whether the other eggs will have anything hatch out of them, we need to really look after them. I will let you know if the next egg to hatch is a quail or a chick…..
You asked about those black things which we call shadows. Shadows are caused by the sun, however if it is dark it is impossible to have one. Our shadows are black because the sun can’t go through our body so it causes a shadow. The more the sun is shining the bolder your shadow is. Shadows are also created by other kinds of light like bulbs, torches, fire and a couple more. To have a shadow you must come to earth because that is where the sun shines. Humans aren’t the only objects that have a shadow, animals, building and plants do too. A shadow is made by the light and something opaque blocking out the sun. Hope this will help you and your friends. P.S: If you have different sources of light it is easy to make a shadow. I am a human from earth and know so much about shadows, so I am about to tell you a lot about shadows. Shadows are made from a thing on earth called sunlight. Sunlight is light from the sun and our black things are called shadows. When it is day the sunlight shines on us and we block this thing called the sun and we create a shadow. When we move we make the shadow/ black thing move too. Also this thing can not be made in night or twilight outside because it’s too dark! In addition, all the things have shadows and if YOU come to earth YOU can have a shadow. Shadows can do lots of things; however there were things called sundials and sundials are made to tell you the time. In addition, if perhaps I was making a shadow and my hand was close to the light my shadow would be big and fuzzy. Furthermore, if my hand was close to my shadow and away from the light my shadow would be clear and small. My hand gets bigger when I grow and so does my shadow. In the evening my shadow gets bigger and in the morning it’s the same as the evening but in the noon it’s smaller because the sun is right over us! This week Aman and Bismah are the editors in the Breaking News university group with Miss Martindale. We were in charge of recording the sound bites and fitting them together. We also had to add jingles and stingers to link the stories together. We think it is a brilliant show so please leave your comments. Don’t forget to comment on the Radio Blog. Firstly, we wore bright yellow jackets, green gloves and litter pickers. We used the litter pickers to pick up litter on Ethel Street. 3S did around the school and told us how fun it was! We were extremely excited about doing the litter pick. We never knew there was so much litter around school and on our nearby streets. After that we went down the road and we picked litter. Then we crossed the road and we went back to school. When we went back to school we were allowed to take a photograph. Do you think the school playground and surrounding roads look cleaner? When we went back to school Matt gave us a certificate, pen and a pencil. It was amazing to do spring cleaning with Matt!